It seems sometimes like the only topic on anyone’s mind is the weather. Now despite what my nieces and nephews often think (and sometimes say), I wasn’t around 150 years ago. But there sure are some snow storms that I remember… and at least one that, this fine post-snowstorm morning, I think perhaps I misremember. When I was young, there was one really epic winter for snow. I remember vividly that it snowed. And it snowed. And it snowed. And the snow didn’t melt between snows — it piled up. And in one particular blizzard-like snowstorm, we ended up with drifts that were mind-bogglingly deep. My older sister and I remember so very well how deep those snow drifts were. It was the only time in our lives that the snow was deep enough for us to dig tunnels through the snow that we could walk through without ducking our heads. We remember in detail the glee we felt when we were able to hollow out igloos in the snow that drifted up next to the house and the nearby junior high school. Now I’m not talking about building snow forts by making snow bricks or snow balls and piling them up. I’m talking about snow deep enough that you could simply carve out a door and then hollow out a space big enough to walk around in. What we don’t remember, nearly as well, is when that happened. What year it was. Neither of us can find any photos of those tunnels or igloos to help nail it down, so we’ve just gone with a general sense of things. And over the years in that general sense of things, I’ve tended to think that our epic snowfall was probably the winter of 1963-64. I suspect I came to that conclusion because that was a winter against which many later years’ snowfall was measured. If you hear “the worst snowfall since 1963-64” enough times, it’s going to stick in your mind. Until the time comes when you want to nail down that family story just a little better… and you realize that what you’ve tended to think is probably wrong. Oh, it’s true that the winter of 1963-64 was a bad year for snow in the area of New Jersey where I grew up. But there are two problems with the idea that our tunnels and igloos were built during that winter. The first problem is that we were a little old for tunnels and igloos by the winter of 1963-64. We were already junior high school and high school age. For me in particular, that was a time when I could well have been voted “most likely to succeed as a sloth.” Getting out of bed was enough trouble. Getting dressed in winter gear and going out gleefully to play in the snow is a most unlikely scenario. 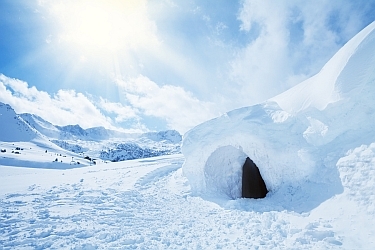 The second problem is that there was another winter that was a bad year for snow in the area of New Jersey where I grew up — and it was just enough earlier to be a better candidate, all the way around, for the winter-of-tunnels-and-igloos. A winter that is, it turns out, very well documented in an awful lot of weather records that the genealogist in me went looking for when I headed out down Memory Lane these past couple of days as the snow began to fall here, once again, in the greater New York metropolitan area. Let me share a few with you. A wonderful resource for folks in New Jersey is the Office of the New Jersey State Climatologist. That site has historical snowfall information recorded for more than 50 different locations as far back as the 1890s in some cases. I picked the report for New Brunswick, the county seat of Middlesex County, and was able to see that the winter of 1960-61 was by far the record-breaker of my childhood: 58.9 total inches of snow. The numbers used come from the National Weather Service, now part of the National Oceanic and Atmospheric Administration (NOAA). You can get a history of the National Weather Service at its website. NOAA itself has a number of interesting offerings. It has its top weather, water and climate events list for the 20th century that you can review online or download as a PDF file. The NOAA News reports things like the 1899 arctic blast that paralyzed the eastern United States and carried ice down to the Gulf of Mexico. And NOAA’s National Climatic Data Centeroffers a large number of options including maps showing temperature (current and historical conditions), snowfall, precipitation and more. • The Weather Base has some 33 years of weather records for New York City and at least some data for more than 29,250 other cities worldwide. • The Weather Warehouse has Historical Monthly Weather Data “for over 18,000+ current and former United States weather stations for every year that each station reported” — which means, for example, for Central Park in New York City you can get data back to 1900, or for Decatur in Wise County, Texas, back to 1904. • WeatherForYou has a daily bit of weather history (for yesterday, the key events were an overnight freeze in 1777 that helped George Washington and his troops flank the British to get to winter quarters and, sigh… some record highs in 1989). • There’s still an Old Farmer’s Almanac, with historical weather data by zip code, accessing weather archives for more than 1,300 stations across United States and Canada, going back to 1960, but more detailed customized access to historical weather info requires a subscription. You can find out all kinds of information about weather disasters on GenDisasters — the website setting out “Events That Touched Our Ancestors’ Lives.” These include floods, hurricanes, ice and snow, storms and lightning, and tornadoes. • Try WolframAlpha for weather information too. You can enter, say, “weather January 3, 1975 New York City” as a search term and get an amazingly detailed weather report. The data doesn’t go back all that far — but as far as it goes, it’s dynamite. And there are newspaper accounts, too, like that 1864 New York Times article. I remember it well! And could have helped you on the date, for I only lived in Creskill, NJ for one year. The snow came so high up the front door that we started a tunnel right there. And another one from the garage, though that collapsed pretty quickly. After that my father insisted we take rope with us so we could be pulled out of future collapses. We had the same monster snow fall in central Pennsylvania in 1960-61. I remember hollowing out the piled snow at the two street-side corners of our driveway for snow forts that lasted from early November until the end of March. Ah, the good old days…. The Blizzard of 1947. Three hundred people went to one of the local movie theaters that Christmas afternoon and left the theater three days later. The US Army had to dig them out. Most were evacuated through the fire escape on to a troop transport. These hardy souls marched as a group, “The Blizzard of ’47 Club”, in every parade the town had well into the 1970’s. The snow melted about Easter. At least one member of my extended family was there and never told his mother. I remember the blizzard of 1978 in Boston! I was fresh off the plane coming from Europe and setting foot for the first time in America. We were able to claim our car in Bayonne and drive to Boston to meet my in-laws for the first time just before the big storm really hit. I have wonderful memories of those couple weeks, with my new family, in the snow that made Boston so beautiful and quiet before we headed to …. El Paso…by car…., which at the time felt like the other end of the world. Thanks for the memories and for pointing out that weather is important in Genealogy. Annick, El Paso is the other end of the world from Boston!!! I was born in northern Minnesota, 30 miles south of the Canadian border. We had plenty of snow up there. I now live 12 blocks from the Pacific Ocean in California. I still have plenty of cousins in Minnesota and Wisconsin who love it there. Winter and I are not a match made in heaven, Gus. So why exactly do I still live in the northeast?????? You might enjoy The New Jersey Weather Book by David McWilliams Ludlum, Rutgers University Press, 1983. There are used copies on several websites for less than $5.00. He also wrote several other historical weather books, all of which are a delight in my opinion. PS. I lived in Morris County, and the 1947 Snowstorm is my earliest memory. My father opened the back door after he had shoveled the sidewalk so I could see it and there was nothing but a wall of snow on both sides. Ah, yes, I do remember those snowy winters those years. And I also remember the big blizzard of late December 1977, when the snow accumulation exceeded 3 feet in some spots, and we were snowed in for almost 3 days (the cul-de-sac where my parents lived got plowed out that soon only because one of our neighbors was a member of the local volunteer fire department, and was given priority accordingly). That memory enabled me to date a packet of photographs found in my Mom’s house when I was cleaning it out. Mom was a photographer (and still does a little bit of it to whatever extent that she still can) and had developed and printed the black-and-white photos herself in her own darkroom, so there were no dates printed on the back of the photos. But one of the photos in the set was of me and an old flame. I remember negotiating the only sale I had during my brief real estate career, and then going to directly from there pick up this woman to go to a pre-New Year’s Eve party. To corroborate the date of the photos, I went to the Pennsylvania Department of State website [http://www.licensepa.state.pa.us] and looked up my real estate sales license, which was active from October 1977 to February 1978. [And yes, being happily married as I am, I did trash the photo of me with the old flame.]. >> [And yes, being happily married as I am, I did trash the photo of me with the old flame.]. Smart move. Very smart move. Growing up I always heard about the Thanksgiving 1950 Blizzard that basically shut down the state of Ohio. My father and several other men in the neighborhood took sleds, toboggans and whatever else they could drag through the snow to get to the store because there was no way anyone could drive. However, the Ohio State-Michigan football game was in fact played that Saturday. Oops – correction. 1950 was considered a storm, not a blizzard. However January 1978 was definitely a blizzard. My mother allowed as how that event topped the one in 1950. Remember, when Sandy hit NJ, it wasn’t a “hurricane” either… Sometimes the labels make no nevermind at all! This is a very interesting topic. As a gift for members of my immediate family, I printed (from microfilm) and laminated the front page of the newspaper from the day they were born. One paper mentioned extreme cold, and the headline on another was about a cyclone. This prompted Dad to reminisce about driving Mum to hospital in near-cyclonic weather conditions when my youngest sister decided to arrive early while they were away on holidays. We all have these memories of weather events, don’t we, Judy? Weather is so much a part of our lives affecting what we do, why and when! I think I’m a little late on this blog, but regarding the winter 1960-61 season, besides the 3 huge snowstorms, and one was the most prolonged cold waves of the 20th century, what I find equally interesting is how abruptly that winter ended. If you look at the weather history for February 1961, the temperatures were in the mid 40’s by the 2nd week and hugging 60 by the 3rd week. Interestingly, the winter of 1977/78 was equally intense with heavy snows and deep cold, and it didn’t start to warm up until late March. I really have enjoyed reading about the weather conditions over the years! I am here because I was born on Valentine’s Day in 1961 and I was curios what the weather was like the day I was born! I hope you find your answer! !